To calculate the electric field produced by a single positive charge, the first step is to select the spherical Gauss surface with radius r where the center of the sphere is at the single charge. The surface area of the ball is 4πr2. 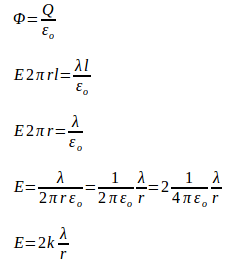 E = electric field, k = Coulomb constant (9 x 109 N.m2/C2), Q = electric charge, r = distance from the electric charge. This is the formula of the electric field produced by an electric charge. This formula can be derived using Coulomb’s law. A homogeneous positively charged solid ball has a total charge of Q, volume V = 4/3 π R3 and the charge density in the solid ball is ρ = Q/V. Determine the electric field strength inside the ball and outside the ball. The solid ball with the radius of R, while the selected Gauss surface is spherical with radius r, where r < R. The volume of the solid ball is V and the volume of the Gauss sphere is V ‘. 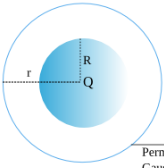 A solid ball has the radius of R while the Gauss surface is spherical with radius r, where r > R. The solid ball charge is Q; the solid ball is inside the gauss ball so that the electric charge in the gauss ball is Q. Hollow balls with the radius of R and volume V = 4/3 π R3, with homogeneous positively electrically charged on the surface with total charge Q. Determine the electric field strength inside and outside the surface of the sphere. The ball is hollow, so the electrical charge is on the surface of the ball, while on the inside of the ball there is no electric charge. If the selected gauss surface is spherical and the gauss ball is inside the hollow ball, there is no electric charge inside the gauss ball. Electric charge is zero, so the electric field is also zero. So the electric field inside the hollow ball is zero. The ball is hollow with the radius of R, while the selected Gauss surface is spherical with the radius of r, where r > R.
The electric field coming out of the center of the ball penetrates perpendicular to the surface of the sphere so that the formula of electric flux is Φ = E A = E 4π r2. The formula of Gauss’s law is Φ = Q/εo. A thin wire has an infinite length, positively homogeneous electric charged with a charge density λ. The electric charge on the wire is Q = λ l. Determine the electric field strength around the thin wire. Gauss surface is selected with the form of cylinders with length l and radius r. There are two forms of surfaces, a circular surface with radius r located at both cylindrical ends (the surface area is 2πr2) and a cylindrical surface with a length of l (the surface area is 2πr l). The electric charge is positive therefore the electric field exits the wire perpendicular to the surface of the tube so that the electric flux is Φ = E A = E 2πr l. Instead, the electric field is parallel to the two ends of the circular tube so that the electric flux is zero.